This entry was posted in Uncategorized and tagged learn Swedish, learn Swedish online, Speak like a Swede, SWEDEX, Swedish at work, Swedish beginner, Swedish courses, Swedish exams, Swedish intermediate by admin. Bookmark the permalink. I am a new visitor and really enjoying your posts. My family live near this area so I know the scenes well and your photos are just dehglitful. Guess I will be back again soon to see how the seasons progress. These numbers make sense. I have reached level A2 after several months of intensive self-studies, 8 months after starting passed B1 national exam and after 1.5 years I have passed exams for B2.1 while studying on average 2-3 hours a day and working in Swedish speaking environment. 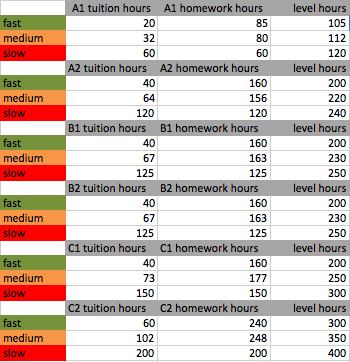 The fastest learning people in my courses have had similar tempo like me. By the way, I have not taken the most intensive courses, only those of average intensity (SFI, SVA1-4). I’m having exams for C1 level next spring after 2 years since I have started learning the language. You can literally learn Swedish in 6 months just by listening to it. It’s so similar to English as to be a bit of a joke to learn, even when compared with languages like Spanish or French.